Apple just updated its “How to Buy” page for the iPhone 4S earlier today with instructions on how U.S. and Canadian customers can go about getting their hands on an iPhone 4S. Apple is now insisting that potential buyers must first reserve the new phone online before heading into an Apple retail store to buy it. iPhone 4S is available in store by reservation only. Reserve yours after 9:00 p.m. tonight for pickup tomorrow. When you come in, you’ll choose a carrier and plan, and we’ll get your iPhone up and running before you leave the store. Keep in mind that the iPhone 4S sold 4 million handsets on opening weekend, so this decision shouldn’t come as much of a surprise. 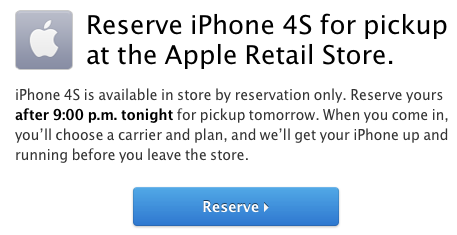 Apple obviously just wants to control the large amounts of people heading out to retail stores for the new device. However, it would seem unlikely that Apple and their employees would refuse to sell unreserved phones to walk-in customers. This leads one to think that Apple will take reservations online, but will then sell the extra stock to customers on a walk-in basis.